Jung-ak-dan is an altar for praying to the Spirit of Kye-ryong mountain which is traditionally believed to be one of the most spiritually powerful mountains in Korea. The space of Jung-ak-dan, consisting of one building and its courtyard, has a calm, sacred, and symmetric balance. The 3-bay building, which was rebuilt in 1879, is enclosed by a continuous rectangular wall to define a place for concentrated worship. The Choseon dynasty royal family used to perform a religious service to the Spirit of the Mountain here every year. 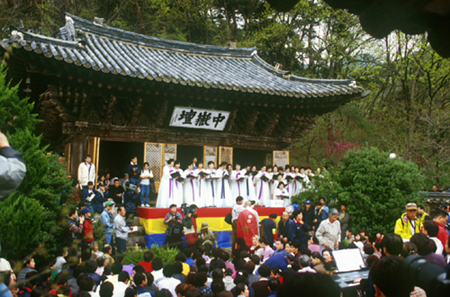 In April 1998, the annual religious service to the Mountain Spirit was resumed, bridging the gap of one century in which religious service were not performed. During the service, the Jung-ak-dan building and its courtyard are crowded with many people who have come from all over Korea to experience the service. The service is accompanied by the Tea Dedication Ceremony and a series of fascinating Shamanic dances and Gut or exorcisms. Gut is a traditional artistic prayer which is composed of vocal and instrumental music and dance. 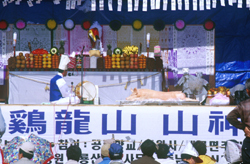 The Shamans or exorcists who perform Gut in this service are the highest-level masters in Korea. The audience is moved by their wonderful performances which usually have precise rhythm and palpable energy. The mood of the service is enlivened by the music of folk bands composed of villagers from the surrounding countryside. Their musical performances are a kind of magnetic pole which attracts and unifies the people of different generations. Here, we see a rare human solidarity which has slipped from our memories.